This year is shaping up to be the year of transitions, for me and for my family. 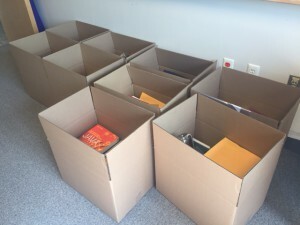 After 12 years in the same office, I’m moving (temporarily, maybe?) to a different office, in the same building but separated from most of my departmental colleagues by 2 floors. Our newest hire is moving into my current office, close to pretty much the entire department, so that she can benefit from all the informal mentoring that proximity to more seasoned colleagues brings. While I’m sad to leave the only office I’ve known at my institution, the move does bring some good opportunities—my new hallway is filled with colleagues from another department, one we should have closer ties with, but don’t. I’m looking forward to making new connections, and to not having to climb 2 flights of stairs every morning! My son is starting a new preschool in the fall. Like many US parents of boys with summer birthdays, we’ve decided to wait one more year before sending him to kindergarten. For a variety of reasons we thought it would also be useful for him to have a change of scenery and routine to better prepare him for school. This is a huge change for him, as he’s been in the same daycare with the same provider and preschool teacher since we brought him home. We’re also leaving the daycare that we’ve been at forever (since my third grader was 20 months old), and moving our kids to after-school care programs that work better with our new schedules. So we’ll have 2 kids at 2 different schools and in 2 different after-school care programs. Luckily the schools are just down the street from each other, and the schedules are mostly the same, but I can sense some tricky logistics days in our future. We have a really good daycare situation going right now, so it will be hard for us to say goodbye to that at the end of this month. There are other changes, too. Our department continues to grow—we’re hiring tenure-track AGAIN this year. We’re no longer a small department, an identity we’ve worn proudly since we amicably separated (consciously uncoupled?) from the Math department 10 years ago. We’ve worked really well together as a small department, but now we need to figure out how to work well together as a medium-sized department. What does that even entail? I’m not sure, but I feel like I’ve made a few missteps lately as chair, and that I haven’t done a great job of making people feel heard and in the loop, so clearly some things have to change. I’m also in my last year as chair, which means I’ll be starting to think about transitioning over the chair to the next colleague in line. (Complicating things is that this colleague is on sabbatical all this year, and I will be on sabbatical the following academic year. So much for easy transitions…) I’ll relish all of the “lasts” that will happen this year (last department retreat to plan! last department annual report to write! ), but I’m sure I’ll also spend a fair amount of time thinking about what I still want to accomplish this year as chair. Even our girl scout troop is changing! We’ve pretty much had the same core group of girls in our troop since kindergarten. Three, possibly 4, girls are leaving the troop, and it looks like we’ll have at least one new girl (possibly more, since we’re doing a bit of recruiting this year). It will be interesting to see how the social dynamics of the troop change, both as the girls grow up and as a different mix of personalities comes in. So here’s to heartfelt goodbyes and new beginnings, and lots of new adventures in the year to come!